Fluenta, a leader in ultrasonic flare metering for the oil and gas industry, has recently announced that the Colorado Engineering Experiment Station (CEESI) has tested its meters. Fluenta tested its 160 flare gas meter at the CEESI testing facility. The results showed that without any initial calibration, the Fluenta 160 flare gas meter performs with an uncertainty of less than 3% even at low flow velocity. When Fluenta products are installed and calibrated by specialist engineers, uncertainties of between 1 – 2% can be achieved. Fluenta conducted CEESI testing on behalf of Kuwait Oil Company (KOC) to assure the company of the accuracy of Fluenta flare gas meters before it committed to a large-scale purchase. After successful CEESI certification, Fluenta’s engineers carried out a successful factory acceptance test (FAT) to ensure the meters were ready to be installed and tested onsite by KOC. CEESI offers a custom piping setup, which allowed Fluenta to test its meters on a 30 in. spool piece and at low flow conditions, from 1 - 20 m/sec. Data from the reference meter and the Fluenta meter was fed to the CEESI data acquisition centre for 30 sec. to calculate the average value that reflects stable flow conditions. 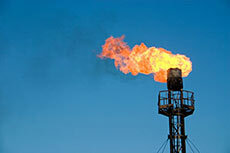 The basis for controlling the burn efficiency in flare began to take hold in the 1980s as the EPA concluded that flares that are properly designed and operated can result in combustion efficiencies in excess of 96.5%.